Eternity looking for an inkjet cartridge. Eternity waiting for a clerk to help me find one. Lake of Fire works for me. 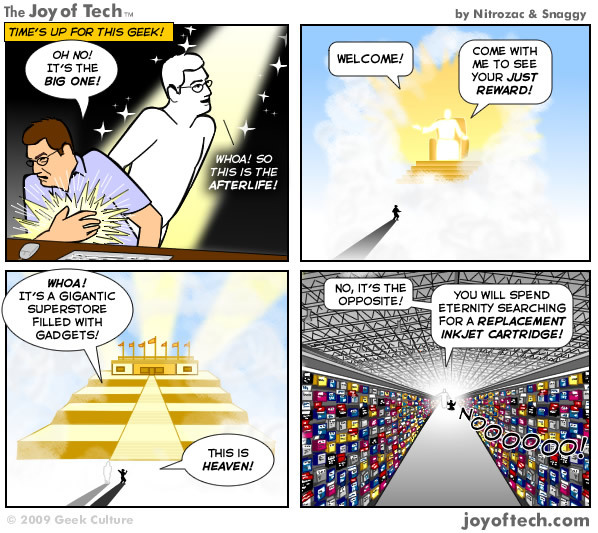 The Joy of Tech is a comic about technology and pop culture. We like to feature the people and events that are making tech news. We tend to focus on Apple news and events because they often affect the industry in general, and because we are longtime Mac users here at GeekCulture Headquarters. We create The Joy of Tech using Apple computers, mostly on our MacBook Pros, running Mac OS X Leopard. We use software from Apple, Adobe, Macromedia, BBedit, and Microsoft. Nitrozac uses a Wacom tablet to do her illustrations.